After months of back-and-forth renegotiations, it appears Strikeforce and M-1 Global, the Russian based company that manages Fedor Emelianenko, have finally come to terms. Strikeforce announced Tuesday morning that Emelianenko will meet Fabricio Werdum on June 26th inside the HP Pavilion in San Jose, CA. Although the news isn’t earth shattering, Strikeforce must feel a great sense of relief knowing their prized employee is once again a happy camper. The heavyweights were originally expected to meet April 17th at “Strikeforce: Nashville” on CBS, then again on June 16th in Los Angeles, however contract talks stalled between M-1 Global and Strikeforce – leaving the pair sitting idly for months. Although over four million Americans tuned-in to see Emelianenko on CBS, with millions more watching worldwide, something was still not sitting right with Emelianenko and Co. 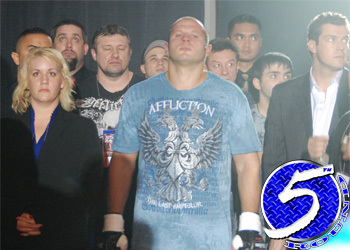 Following their successful primetime broadcast, it is believed Team Fedor approached Strikeforce in hopes of renegotiating the three-event contract they inked less than a year ago. Strikeforce CEO Scott Coker recently told 5thRound.com that contract talks were progressing and he hoped to have his golden boy back by the summertime. Werdum, who was released by the UFC last year after posting a mundane 2-2 Octagon record, boasts a respectable 13-4-1 overall mark and is perfect in his two scraps for Strikeforce. He was last seen taking a hard-fought unanimous decision over Antonio “Big Foot” Silva on the same “Strikeforce: Fedor vs. Rogers” show. No other bouts were confirmed for the Showtime broadcast, however it has been heavily rumored the middleweight rematch between Scott Smith and Cung Le will be added to the card.